The design and beauty of Indoor Putting Greens from Custom Turf Outlet will bring greater property value to your location. It also provides a place of entertainment for group activities and a place to practice your short game, when traveling to the course or range is not an option. Create a small getaway in the office or at home for catering to clients or bringing the love of the game to the next generation. The skilled staff at Custom Turf Outlet have over 20 years of experience in designing location specific for putting greens to suit almost any space. We also use digital imagery to splice the exact dimensions of your space. We work directly with our customers to create their perfect putting green and provide continuing support on installation and maintenance. We can help you put practice your putting in your den, garage, basement or anywhere you want. The use of high quality synthetic turf materials coupled with easy to follow installation instructions, make setup quick and painless while guaranteeing years of use. 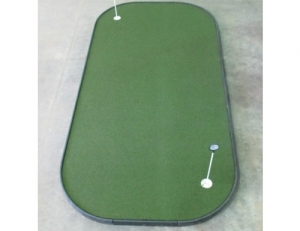 Adding one or more Indoor Putting Greens purchased from Custom Turf Outlet brings the green to you and lets you play on your schedule, regardless of season or time of day. Begin the process today and let us build your dream.